Fluoride is a mineral that occurs naturally in many foods and water. Everyday, minerals are lost and gained from your tooth enamel. When minerals are lost, it’s due to acid from plaque and bacteria that eat away at your tooth. Minerals can also be added to your tooth’s protective enamel through consumption of fluoride, calcium, and phosphate. These minerals actually strengthen your teeth, and better protect them from tooth decay and cavities. Fluoride intake is most important when your child is between the ages of 6 and 16 because this is the general timeframe of when their adult teeth come in. That being said, adults can continue to strengthen their teeth using fluoride as well. Thankfully, most communities have fluoridated their water supply in an effort to combat tooth decay. So, tap water is a great way to give your child fluoride without them even knowing it! If they like bottled water, check out the ingredients label to make sure the bottle has fluoride in it. Toothpaste is another great way to make sure your child’s teeth are receiving the minerals they need. Hopefully they’re already brushing, so just make sure the toothpaste they’re using contains fluoride. You can look at the ingredients label, or some products even advertise “fluoridated toothpaste” on the packaging. It can also be found in mouthwash. Just look for a bottle with an American Dental Association (ADA) seal of approval and make sure it contains fluoride. Mouthwash is a great finishing touch to you and your family’s brushing and flossing routine. Your dentist can also apply fluoride in the form of gel, foam, or varnish. 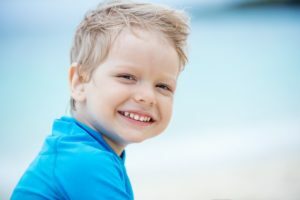 This treatment has a much higher level of fluoride than the other products mentioned above, so if your child struggles with cavities, you may want to talk to your dentist about this preventive care option. Fluoride is an easy way to keep your loved ones ahead of cavities and tooth decay. The best part is that this amazing mineral is commonly found. Take your pick of some of the items we’ve listed above to keep your children’s smiles healthy and happy. At Brush Pediatric Dentistry, we have a team of 3 expert dentists ready to provide quality care for your children. Dr. Mira Albert is a board-certified pediatric dentist, so she’s a highly-trained expert in children’s dentistry. She can be contacted through her website or by phone at (630) 504-2223 for any questions you may have.